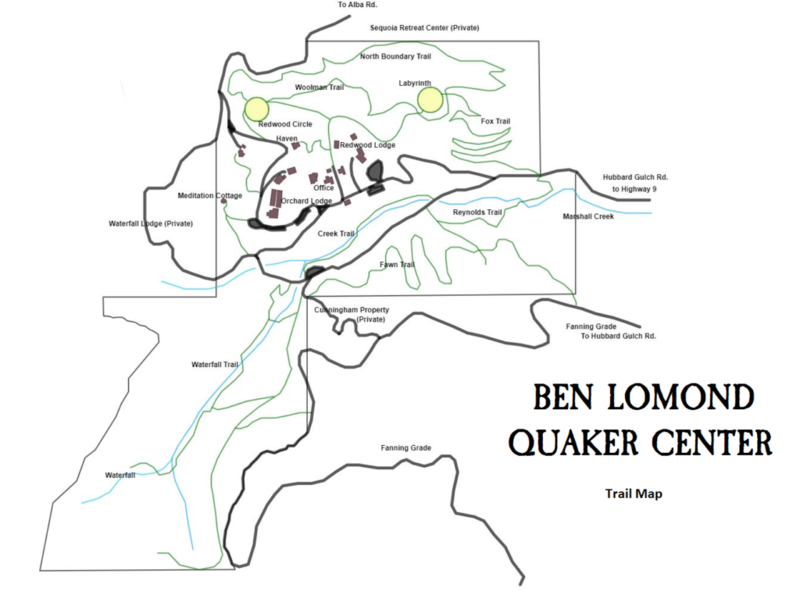 Here at the Quaker Center we have hiking trails and a labyrinth that you are welcome to visit during the day. We ask that you sign in at the office before you go for a walk and be prepared for steep, forest terrain by wearing sturdy shoes with treads and seasonally appropriate layers of clothing. If you are visiting for the day, please do not enter the lodges or retreat cabins because they may be in use by programs and private rental groups. All pets must be kept on a leash and must be under your control during your entire visit. 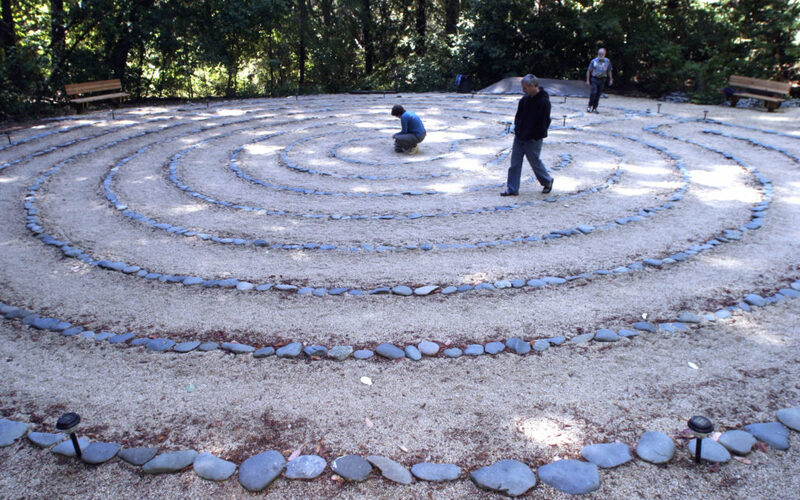 Located in a secluded clearing in the Santa Cruz mountains, the Quaker Center labyrinth is about 50 feet in diameter and contains seven cycles. Laid out upon a foundation of local mountain granite from the Santa Cruz quarry, the paths are lined with smooth river rock. The labyrinth is available around the clock to all Quaker Center users. Members of the general public who would like to visit and walk the labyrinth are asked to call the Quaker Center office (831-336-8333) to insure that they will not be disturbing groups who are already on the property. The labyrinth is an ancient pattern found in various forms throughout the world. Labyrinths continue to fascinate humankind — as pathways to spiritual growth and expanded ways of knowing. Labyrinths can be used as a spiritual practice for reflection upon one’s life, for seeking direction or comfort, or for celebrating joy. 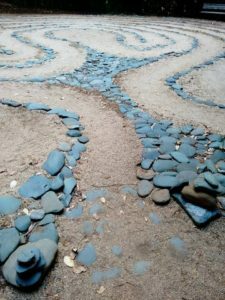 The use of a labyrinth was first brought to Quaker Center by Tom Davis, a retired accountant, certified spiritual director, and member of the Santa Cruz Friends Meeting of the Religious Society of Friends (Quakers). In the fall of 2000, Tom laid out a temporary labyrinth out of yellow nylon rope and metal stakes. It took him about two hours. 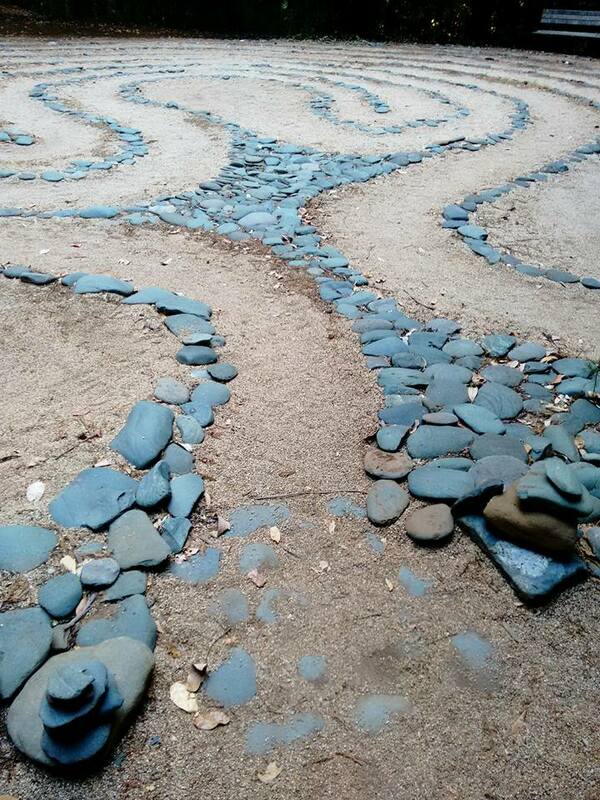 Over the next year, Quaker Center and other groups using the facility asked Tom to revive the temporary labyrinth for other workshops. After installing the temporary labyrinth by hand a number of times, Tom began the quest to bring a permanent outdoor labyrinth to Quaker Center. Money was raised, a site and design was developed, and construction started in the spring of 2002.